Busy week, friends! 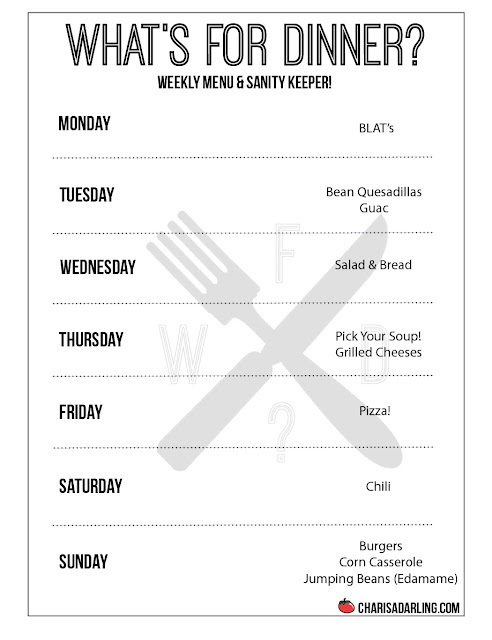 This week's menu is super simple because of it, but goes to show that dinner can be done when the busy gets going, thanks to a little planning...and eating dinner at 4:30 before rushing out the door. Monday will be BLAT's. Sliced fruit and carrots, then out the door to soccer! On Tuesday I'll make bean quesadillas and guacamole. Wednesday we'll have Caesar salads and bread. Rotisserie chicken too, if I hit the grocery store at the right time! On Thursday we'll have grilled cheeses and soup. Vance and I go for tomato, the others usually go for chicken and noodle. Either way, it's easy! Chili on Saturday, since the weather is finally cool enough for it. My family prefers chili mac, so I make a pot of macaroni noodles too. BBQ on Sunday! Beef for them, veggie - or possibly a portobello mushroom for me. Corn casserole, and Vaughnie's favorite, edamame, or as she calls them, jumping beans. Hope this gives you some ideas! Have a great week!